I've said it before (and maybe I was whining a little bit at the time), holiday meals just aren't the same when you're vegan. Not that I have any desire for turkey. I really don't. Quite the opposite - I would be thrilled if everyone at the table was enjoying a delicious, plant-based feast. That's why I said, "Yes please!" 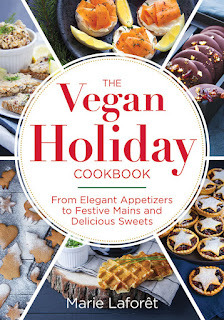 when Robert Rose offered to send me a review copy of The Vegan Holiday Cookbook: From Elegant Appetizers to Festive Mains and Delicious Sweets . For the simple holiday meals that we enjoy as a family of four, we tend to cook a store-bought turkey alternative or we make this easy tofu loaf. But The Vegan Holiday Cookbook, created by Marie Laforêt, has me seriously considering the need to up my holiday food game. So today I want to tell you a little bit about the types of recipes you can find in the cookbook, and share two incredible dessert recipes for you to try out this holiday season and beyond. The full title of this vegan cookbook kind of says it all - there are more than 60 recipes for holiday-worthy appetizers, mains and desserts. To give you some examples, for starters there are three types of vegan "caviar" that you can serve on Paris toasts or blinis. The squash truffles sound amazing, as do the vegan sausage mini tarts (I can see building a whole meal around those). Several of the recipes are gluten-free as well as vegan. There is a page following the introduction that lists the gluten-free recipes and also other recipes that are easy to adapt to be gluten-free. There are also four themed menus suggested, depending on whether you're looking to make a traditional meal, a light and sophisticated dinner, a buffet or a last-minute meal. As an alternative to the usual soups, there's a recipe for ravioli in flavored broth that sounds delectable. For mains, you can try your hand at making your own tofu roast, complete with stuffing and glaze. Or how about "Lentil Wellington" with roasted carrots? Seitan Wellington, tofu medallions, Swedish meat balls - the list goes on and each recipe is more tempting than the last. The dishes are beautifully depicted in full-colour photographs. 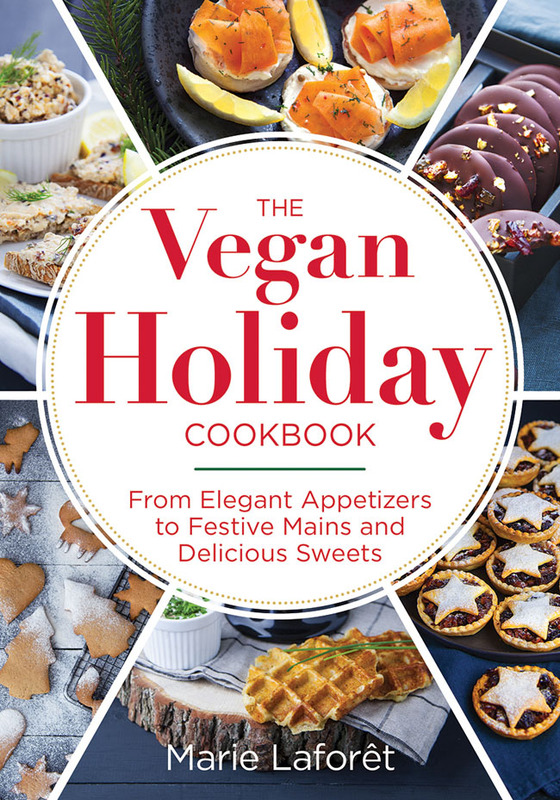 The Vegan Holiday Cookbook is a great resource for anybody looking to create impressive, special occasion holiday meals that will delight meat-eaters and vegans alike. Of course, given a list of recipes to choose from, I went with two desserts. You're welcome. Seriously though, I think my mind is always on dessert, especially at Christmas. The first recipe, the Snow White Layer Cake, I chose because it reminds me of a cake I made for my husband many years ago when I was still unmarried and living with my parents. I remember that cake took so friggin' long to make. We were planning to go out and I think I was exhausted by the time he came to pick me up. But it was a good cake, all topped in coconut, like Marie's lovely vegan cake. I'm also sharing the recipe for her "Shortbread Forest" because every Christmas cookie platter needs shortbread, and also look how adorable the cookies look in her photo! 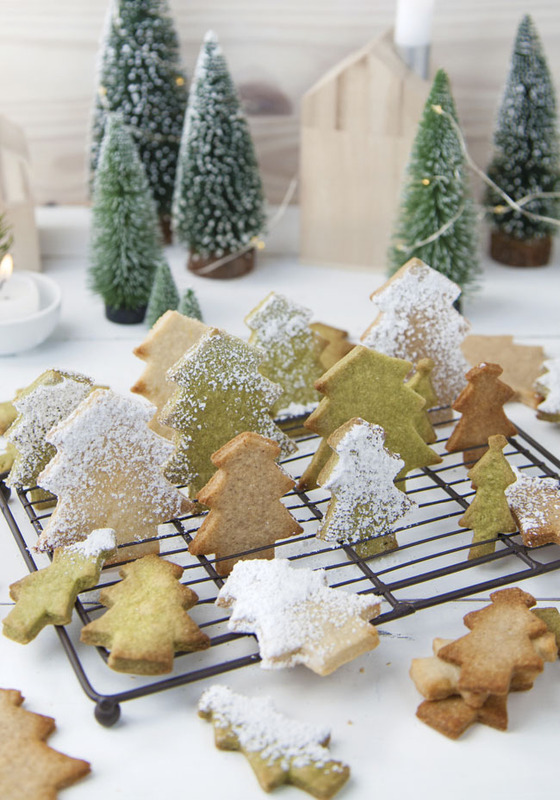 The intro to the recipe suggests making an entire forest of shortbread cookies of different colors and flavors instead of making a gingerbread house. Or tuck the cookies into little gift bags as gourmet presents. A Paris resident, Marie Laforêt has written over a dozen vegan cookbooks. Visit her at www.100-vegetal.com. I love to give and get books as Christmas gifts. Do you? You can shop my book recommendations here on Amazon. In a large bowl, whisk yogurt, oil and vinegar. Whisk in sugar and ground almonds. Whisk in baking powder, vanilla powder and almond extract until well combined. Whisk in milk, then gradually stir in flour. Stir well until batter is smooth. Using a kitchen scale, divide batter into 4 equal portions by weight. Spread one portion of batter in each prepared pan. Bake in preheated oven for 20 minutes. Unmold and let cool completely on a rack. Open cans of chilled coconut milk and spoon solidified cream on top into a bowl (reserve thin liquid for another use). Whisk coconut cream with vanilla powder and confectioners’ sugar to taste. If necessary, use a wire cake leveler or serrated knife to level tops of cakes so they are completely flat on top. 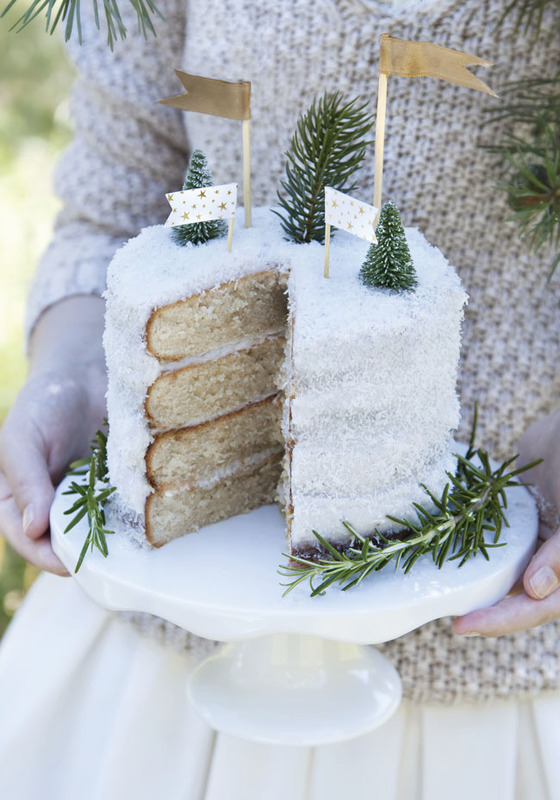 Place one cake layer on a serving platter and spread a layer of icing on top. Repeat with the remaining layers. Spread icing over top and sides of cake and cover with shredded coconut. Refrigerate until ready to serve. In a bowl, combine flour, sugar and salt. Stir in desired flavoring. Using your hands, mix in nut butter and oil. Add milk and stir until dough is an even consistency. Form dough into a ball, wrap in plastic wrap or parchment paper and refrigerate for 30 minutes. Roll out dough and cut out cookies. Place cookies on prepared baking sheets, spacing them evenly. Bake, one sheet at a time, for a few minutes, until cookies are golden on the edges. Let cool on a rack. Decorate as desired. Recipes courtesy of The Vegan Holiday Cookbook: From Elegant Appetizers to Festive Mains and Delicious Sweets by Marie Laforêt © 2017 www.robertrose.ca Available where books are sold. *This post contains affiliate links. If you make a purchase after following a link Woman in Real Life may earn a small commission. Your price is not affected. What a fantastic post! I can absolutely relate to you. Thank you so much for sharing a great book and recipes. The cake looks beautiful and delicious. Happy Holidays! Thanks so much Gabriela! You're very kind. :) Happy Holidays to you as well!